I first came across Chef's Basket recipe kits while looking for ready-to-eat meals for my honeymoon. I remember spotting the kits at Alfa and immediately buying two of them. Driving for four hours everyday in New Zealand, all we wanted by the end of the day was to watch some television and relax indoor. 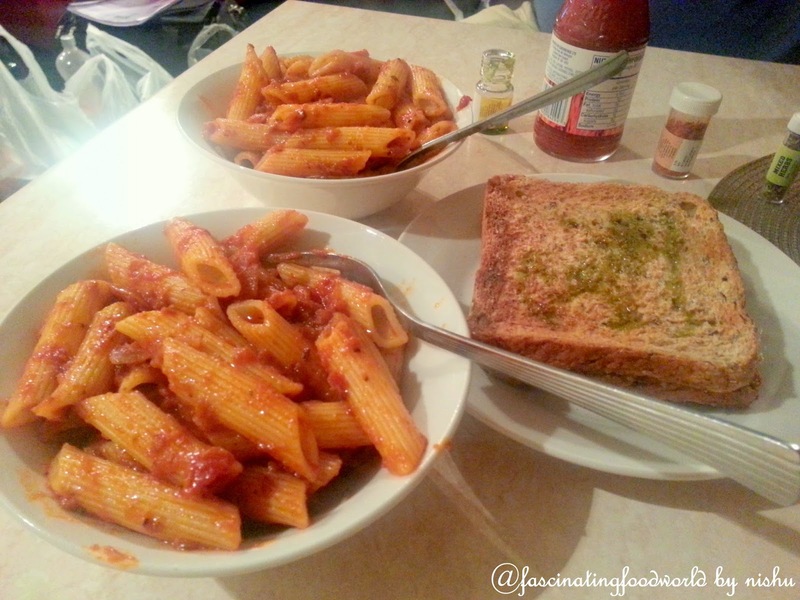 Bored of having maggi and sandwiches, one night we tried Chef's Basket Recipe kit- Creamy Tomato in Penne. I expected it to be boring, dry and average in taste but the Penne was flavourful and good for packaged food. It was as good as fresh.We were so hungry that we literally licked off the bowl and saved some for breakfast. Pasta tasted good next morning too. We also tried their Burrito kit and customized it by adding freshly chopped lettuce and other vegetables which added beautiful crunch to the burrito wrap. It was filling and smoked salsa had a lovely smoky and spicy quotient to it. Chef's basket recipe kits are gourmet ready to cook kits. To be honest with you, I am all about freshly prepared food but these kits are quite handy on days when you want to have something different but lazy to cook or go out. These are ideal for working women, bachelors, newly weds and travelers. Chef's basket is a brand of Fizzy Foodlabs which has been started by IITB pass-outs.They claim that every product is 100% natural and has no artificial colors, preservatives or flavors. Ingredients are picked from all over the world. Chef's basket Recipe kits come in different preparations ranging from Italian, Thai and Mexican cuisine. It is no secret that I absolutely adore Thai food but ingredients like galangal, kaffir lime leaves are not easily available with vegetable vendors. I recently tried Chef's basket Thai kit "Thai green curry and jasmine rice". Curry was aromatic and I could eat taste all of my favourite elements like lemon-grass, kaffir lime, galangal and coconut milk. Jasmine rice was fragrant too. Curry wasn't too green and vibrant in colour which meant that it did not have any artificial colour. For the record, I had no idea that a dried kaffir lime leaf could have so much fragrance, it just lifted the curry to a different level. I am soon going to dehydrate them in microwave and store for using later. Food tastes best when prepared with fresh ingredients but Chef's basket recipe kits are ideal for people whose life is always on a run. Try these when your life also gets busy at times as mine, on a holiday or simply make at home and relish with your family.